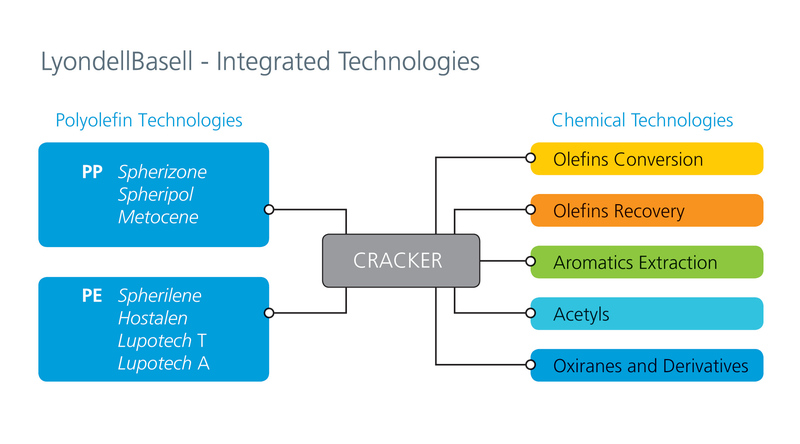 • Olefins Conversion – The Superflex, Prodflex, Isomplus, isomerisation and hydration catalytic processes for the selective conversion of low-value, mixed-olefin streams from crackers to ethylene, propylene and butenes. • Olefins Recovery - Comprehensive set of process technologies for the separation and purification of C4 & C5 olefins, including extraction of butadiene and high-purity isoprene. • Aromatics Extraction - Processes for the extraction and conversion of high-purity benzene, toluene and xylenes from liquid cracker pygas streams and coke oven light oils. • Oxiranes and Derivatives - Leading processes for the production of propylene oxide and its derivatives including butanediol, THF, NMP and GBL. • Acetyls - Acetic acid and vinyl acetate monomer (VAM) process technologies using highly-selective, low-pressure catalytic processes. Prodflex, propylene oxide and acetic acid processes are available for LyondellBasell joint ventures only. • Metocene PP - innovative add-on technology for the production of specialty polypropylene products using single-site catalyst systems. Photo Caption: The graphic enclosed shows the complete LyondellBasell portfolio of polyolefin and chemical technologies.